Rome, Italy – Home to the Colosseum, St Peter’s Basilica and more recently Onda Records. The label was established in 2017 by Gianluca Marcelli aka DJ GLC and duo Cristiano Bencini and Roberto Calamia aka G.I.M (Groove in Mind) Productions. Onda Records describe themselves as an Italian collective of deep house connoisseurs, and we believe them. Their debut release ONDA001 entitled ‘Rising Waves’ featured three promising original tracks from G.I.M Productions and a tidy remix from MINIMONO. Their second outing ONDA002 entitled ‘Colours Vol 1’ is the perfect follow up to what was a sterling first release. Staying true to the groovy analogue house sounds itched onto ONDA 001, Onda Records present a four-track vinyl only release with a BLUE label A side and a RED label B side. The A side presents original material from the aforementioned DJ GLC and G.I.M Productions, whilst the B side is home for two killer remixes from the funkiest Atlanta A Star – Byron the Aquarius and Detroit hardened – Javontte. DJ GLC – Blue is the first imprint on the record and has all the ingredients for an exceptional deep house track. Lush pad sounds and sweeping saturated hats fill out the high end, with a driving kick drum and punchy clap combo to ensure this one will work dance floors. To top it off and get this track swinging a simple stabby bass line rings through from the one- minute mark, and much to our satisfaction does not leave. DJ GLC has recreated a timeless classic house sound, providing a reminder why this sound continues to resonate with generation after generation. The second track of the EP is by G.I.M Productions and is titled ‘Red’. It is easy to see why Cristiano Bencini and Roberto Calamia chose their name – Red was made with groove in mind. Red starts with a bass guitar riff, which would not sound out of place on an 80’s Funkadelic record. The riff leads into several sustained Rhodes sounding chords before dropping into a wonderful soulful house track with an almost balearic twist. 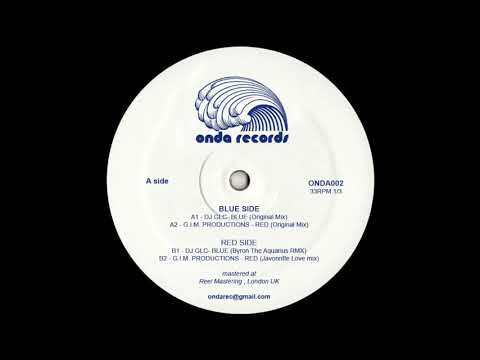 At 96 beats per minute and with the kick pushed back to allow room for the music this one isn’t strictly a peak time track, but used correctly this groovy number could reset a dance floor, and send people into a frenzy.To certify this record’s already glowing exceptional originals, Byron the Aquarius provides a remix of DJ GLC – Blue. Byron is a classically trained jazz musician, and his infectious keyboard work shines through and leaves footprints all over this remix. An acid tinged bass line and resonant keys have twisted this track in a way which shows Byron’s need, obsession and love for melody, harmony and most importantly soul. Shuffled hi-hats reenergise the drums and provide progressive waves of energy throughout. Byron has tipped his cap to the classic deep house sound of the original and has managed to create an essential dance-floor number.The four-track vinyl only release is available now for pre-order, and is set to drop in record stores on 28 September 2018.